Well, things are still pretty mild and summer remains gripping on, like Shauna Coxsey crimping on a tiny technical hold. 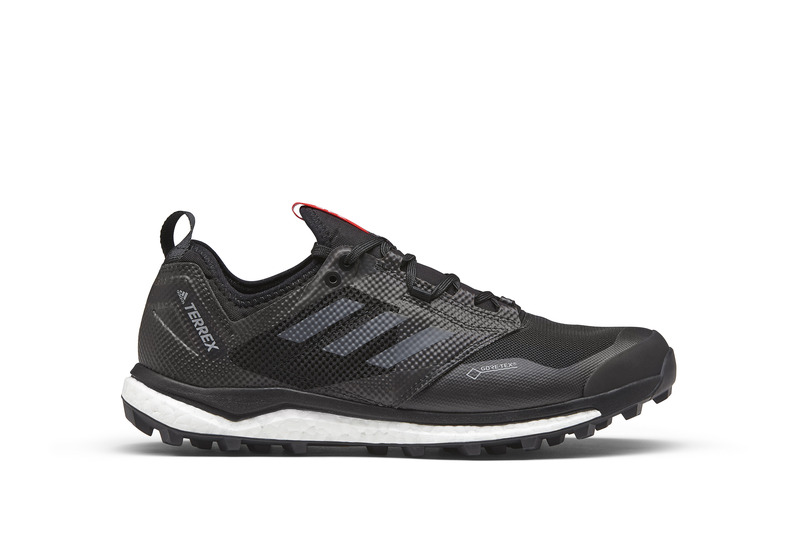 adidas TERREX are a brand who are making a real effort to break into the trail running market and be seen for being more than 3 stripes. This is bespoke kit for the trail, utilising the latest materials, compounds and design ideas. It may not be as readily available as its competition in the UK, but I can vouch the footwear and jackets (here or here) stand up there with the established. Below is a brief look at some key pieces for the older months, including links to the website. To kick things off we have the Alpha Hooded Shield Jacket….. which I reviewed earlier this year. I wasn’t sure how much a Polartec® insulated windproof would function for someone who runs hot year round, but when the “Beast from the East” struck, this became a necessity and I found myself running more often with it the without. Polartec®’s breathable Alpha® insulation at the front, a breathable windproof rear, deep chin cover and two hand warmer pockets make this a great lightweight jacket, when you need more than a windproof but don’t want to go to a full hard-shell. 3 technologies make their way onto the XT GTX. Boost™, Continental Rubber and Gore-Tex®. The XT is designed for extreme terrain, built to last and aimed at all trail types. The Boost™ technology is Adidas’ own responsive midsole, to push you forward and give you the most energy from every stride. With an upper constructed from sturdy materials and large, TPU welds, they (Adidas) want the XT to take a beating and keep on running. Continental’s outsole is a special blend of rubber, based on the Kaiser Project downhill tyre, said to be up to 32% gripper then competitors. And finally Gore-Tex® is used to line the shoe, in order to keep your feet dry in harsh conditions. With a 6mm drop, it’s no racing flat, but should therefore suit a greater number of runners. Aiming to keep your warm where it counts this winter, the TERREX tight has woven material at the front (covering the obvious areas) to keep you warm, as this forms a near windproof layer. Articulated knees aid with running, as are designed to work best when on the move, rather than stood around static in the gym. Reflective side zips from calve to ankle and a rear security pocket keep you seen and your keys safe. After a winter with a dedicated winter tight, I can firmly say, investing is a wise choice. I tested the predecessor of the Climaheat Down Jacket last winter and on the whole I was impressed. For this winter, they have stripped the weight back and developed a new baffle system, to increase efficiency. The Patent-Pending heat seal baffle minimises cold spots and makes it stand out from the previous model aesthetically. Warmth and minimal weight are achieved by combining RDS certified water resistant 90/10 HyperDRY™ Goose down and 800FP light Pertex® Quantam® fabric. The features remain, with two hand warmer pockets, elasticated cuffs, arm pit vents (stretch fleece) and all this for 425g in a medium. If you’re looking for a more aggressive short, one that won’t become saturated immediately when rained on, the Agravic short could be for you. Constructed from an active four way stretch material, with bonded construction, it allows for freedom of movement, while being wind and water resistant. Designed to house energy gels and weighing in at 75 grams, this could be a good option for those who insist on wearing shorts 365 days a year. Much like the Hooded Shield seen at the beginning, the Agravic Long sleeve is a hybrid construction. Blending Polartec® Alpha® with Polartec® PowerGrid® fleece material, it provides freedom of movement and insulation, without being a cumbersome and a boil in the bag jacket. A large front 1/2 zip allows extra ventilation for when you really put down power. For those who want insulation for on the run, but are keen to keep their sweat rate down.